I stated earlier that the best part of Jason Aaron's Star Wars Vol. 1: Skywalker Strikes was the Luke material, but that overlooks the other side of that coin -- the best part is the parallel Luke and Darth Vader material. And indeed Kieron Gillen's Star Wars: Darth Vader Vol. 1: Vader, collecting the first issues of that series running parallel to Aaron's, is the better of the two. Whereas Aaron tells a functional but familiar Star Wars story, Gillen's is atmospheric and expansive, including a moment at the end that all but recontextualizes Darth Vader all the way through to the end of Return of the Jedi. That's no easy feat, and it marks Gillen's Vader as one worth watching. Gillen glosses over the three-issue action-packed opening of Aaron's Skywalker Strikes in the span of a couple panels, and it's indicative of the differences between the two titles. Vader has action, to be sure (including Vader swinging his lightsaber around Jabba the Hutt's palace in the opener), but rarely does Vader seem truly endangered to the reader. There is much, much more royal intrigue, in which Vader, the Emperor, various Imperials, and Vader's new allies joust with words to gain information or stature; the third chapter offers barely any Vader-action at all. 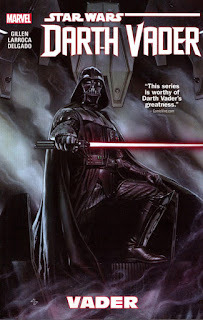 The result is a comic that seems mature, devoted to a good examination of Darth Vader's role in his world, in which his superiors view Vader as just a "blunt instrument" of destruction even as he tries to be recognized for more. I was happy to watch Gillen move Vader in and out of political trouble in the first two chapters, and I have mixed feelings about the introduction of Doctor Aphra in the third. For Gillen to bring an Indiana Jones analogue into Vader is very clever, and then too clever to the point of distraction. Aphra is scrappy, talkative, and chipper, a kind of Robin to Vader's Batman, but I felt at times Gillen was trying too hard to balance the book's dour anti-hero with too much cutesiness. Aphra only really started to work for me when Gillen addresses in an honest, chilling scene Aphra's understanding that Vader will likely end up killing her; there's something twisted there that redeems the comedy. Artist Salvador Larroca gets the faces just right as Aphra and Vader stare each other down here (Larrocca's work is overall fine throughout, though in the explosions I sometimes had trouble telling who was who). Equally good and bad, I think, is Gillen's introduction of the homicidal droids Triple-Zero and BT-1. Obviously they're riffing on C-3PO and R2-D2 (if you want to take it far enough and the Wookie bounty hunter Black Krrsantan stands for Chewbacca, then Vader is Luke, and Aphra and Boba Fett are variably Han and Leia, and the whole cast is here). On one hand, I'd traditionally think Darth Vader needs droids about as much as he needs Indiana Jones, but on the other hand, Anakin Skywalker, we know, is the long-time owner of R2 and the creator of C-3PO, and so the presence of the droids plays into the "it's Anakin under there" aesthetic that underscores the whole story. Indeed, though it's not so played up in reference to the droids specifically, the book is rife with Anakin flashbacks and references to the Clone Wars (and Clone Wars). This is the most work I've personally seen anyone do to align the characters of Anakin and Vader. Early in the book the Emperor specifically references that it's been about twenty years since the Clone Wars, so if we charitably age Anakin at 18 when he became Vader, that would put him at about 40 now. In the interactions between the Emperor and Vader, I could clearly hear Hayden Christensen's impetuousness, and it felt believable that this would be the pair's relationship two decades hence. As well we might see some parallels with Ahsoka in how Vader works with Aphra; there's also nicely subtle references to Anakin's technological and piloting skills. The show-stopper, however, is the final few pages' "revelation," running parallel to Skywalker Strikes, that the Rebel pilot who destroyed the Death Star is Vader's son. One should definitely read Skywalker first, as the revelation is ominous and moving, and then read Vader, because it's even more affecting the second time when one then understands the extensive, demeaning gauntlet the Emperor has just put Vader through right before Vader finds out the Emperor lied about the circumstances of Padme's death and Luke's existence. In Vader's subsequent statement to the Emperor that he "understand[s] us precisely," there's a vein of insurrection one can now see traveling all the way through to when Vader kills the Emperor in Return of the Jedi. In Return, originally, we thought Vader kills the Emperor because he has a change of heart about protecting his son; in Revenge of the Sith, we retroactively learn the Emperor lies to Vader about Padme, but that lie is never reconciled with Vader's generally unaffected knowledge that Luke is his son at the start of Empire Strikes Back. Gillen brings it all together exceptionally well, and I'm eager to see where this book goes as Vader fights from the inside to dispose the Emperor, not just for political gain but now also for reasons of his family. Between Aphra, the droids, and then the cadre of Imperial cyborgs, Kieron Gillen's Star Wars: Darth Vader Vol. 1: Vader at times seems crowded , and at times it feels perhaps Gillen doesn't trust enough that Vader can carry the scenes alone. He can, and some of the best parts of the book are Vader on his own, and I hope that's the direction Gillen goes as the series continues. The Force, I have to say, is stronger with this book than its companion volume, and if I had to choose then this is the one I'd follow. So thrill to see Vador discover the truth about ... well, about everything !